Venice and the Veneto region include a large chunk of mainland Italy, when people discuss "Venice" they are usually referring to main island of Venice and the outlying islands of the lagoon. The main island of Venice is composed of many small islands, divided by canals, connected by more than 400 footbridges. The streets of the main island of Venice, and those of most islands on the lagoon, are entirely pedestrian. 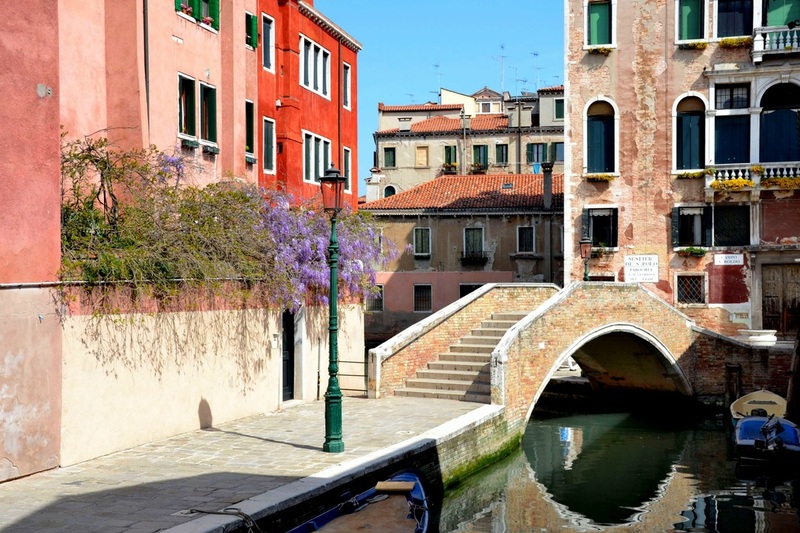 On Venice, your two transportation options are walking or taking a boat. Venice has six districts, called "sestieri" and several outlying islands. The districts are Santa Croce, San Polo and Dorsoduro, on the western side of the grand canal, and Cannaregio, San Marco and Castello on the eastern side of the grand canal. There are many outlying islands in the lagoon. Those that you are most likely to visit are La Giudecca, Lido, San Michele (or "Cimitero"), Murano, Burano and Torcello. It is possible to walk between all of the six main districts of Venice, and there is public transportation, by boat, available to each of the outlying islands. When orienting yourself to Venice, it will be very helpful if you immediately make note of what district you are staying in, the name of the street you are staying on, your nearest boat stop, and your nearest campo or city square. These bits of information will be come in handy for finding you way home after a day of exploring the labyrinth of Venetian streets. A typical Venetian address consists of a building number in a particular district. Most do not even include a street name. As a result, Venetian addresses are virtually meaningless to everyone except the mailman! (In fact, I once overheard a Venetian mailman asking for directions...) This is why walking directions which include references to major sights, street names, churches and bridges are imperative to finding what you are looking for in Venice. There are hundreds of campos (city squares) in Venice. There is a church in each campo, and the campo is always named after the church. Many of these churches are closed or are difficult to distinguish from the surrounding buildings, but they are there. You will often receive directions that include references to a campo and a church. A detailed paper map is important to moving confidently and competently around Venice. Though they have improved immensely over the past couple of years, many electronic maps of Venice are still lacking in detail. The same is true of the paper maps that come in travel guides that you buy overseas. You will find that these also are missing street names, or have the wrong street names. The best street maps of Venice are those sold locally.